Mayor Hall called the meeting to order at 7:00pm. Councilmember McConnell was excused for personal reasons. Last Friday, Nov 16, the Shoreline Police shared a dinner with food provided by members of the Mosque of the Islamic Community of Bosniaks. A Happy Thanksgiving is wished for all. Remember City Hall, Spartan Recreation Center, and the Shoreline Pool will be closed on Thursday and Friday, Nov 22nd and 23rd. Councilmember McGlashan - Sound Transit announced today that they secured 1.2B in FTA dollars (Federal Transit Administration) which represents about 40% of the Northgate to Lynnwood Link Light Rail. This is subject to a 30 day congressional review which it is expected to pass. Councilmember Roberts - Last week he attended the Sound Cities Assn Public Issues Committee (PIC) Meeting and they adopted their 2019 legislative priorities which broadly included an amendment suggested by Mayor Hall. He also attended a lengthy nominating committee meeting for the PIC representative to the Sound Cities Assn Board with results to be reported within the next week or so. Richard Miller stated concern that the new construction at Parkwood Plaza may not be ADA compliant (needing ramp). Mayor asked that a City Staff member speak to him personally. Several speakers offered comments regarding the proposed Aquatics and Community Center swimming pool (Susie McDowell, Lyn Sherry, Angie Nouwens, Vicky Jaquish and Terry Goldstick). They stated, among other things, the need for an 8-lane pool in an L-shape in order to provide a diving area as well as an adequate number of lap lanes. Without this, the pool would be too small for school competitions, and Shoreline schools may have to change swimming from a “no-cut” sport due to lack of room. This would mean not all students could compete regardless of skill level. Also needed is adequate deck and viewing areas. The larger size will support greater overall use of the pool resulting in increased revenue. The Agenda and Consent Calendars were approved unanimously. Bruce Amundson restated his request from the last Council Meeting for additional funding for the installation of a completed public sculpture, thanking Councilmember Roberts for introducing the amendment. He also mentioned the 6-year plan adopted last year by the parks department, that included a plan to create Aurora as an “Avenue of Art” by placing large-scale dynamic sculptures along the corridor on public and private land. This would set Shoreline apart from other cities’ use of Aurora. He would like to move ahead with this over the next few years. Roger Feldman, Herb Bryce, Rick Leary, Eric Swenson, Lorie Hoffman, and Elana Winsberg are, among other things, active members of the Shoreline arts community and all supported the 50k expenditure. They also spoke of public art as an indication of what Shoreline is and wants to be as a city, that the personality of a city is judged by its backing of education and art, that art has a broad appeal to all ages because it tells a story, makes you feel, and is not language specific. Both Edmonds and Seattle have neighborhood art. Shoreline currently lacks some of the vibrancy that art can offer. James Pabiniak, the Hopelink Food Bank Supervisor, thanked the City for its continued support of Hopelink. This is based on the most recent information available. Final numbers have not yet been certified by the County. The Action taken today by the Council sets the Dollar and Percentage Increase for the levy. In addition to the regular levy, there is the excess levy of $1.7M which pays the debt service for the 2006 parks bond. The levy rate for this should drop to about 16 cents. Mayor Hall asked for clarification, since property values are going up, why isn’t the City getting a lot more money based on the increased values? Then why is the rate going up? Other variables in determining the rate include School Levies and last year’s increase due to the McCleary Decision. The assessed property values are used to distribute the tax burden. The Regular Levy is the tax burden or City budget. The rate has gone down, but the assessed value of the home is higher, resulting in no reduction in taxes. Ordinance 842 was adopted unanimously. Since there have been multiple discussions regarding this Ordinance, including a question matrix, Council will proceed with proposed Amendments. A review of the City Reserve policy. Perhaps this would be appropriate at the Council Retreat. Councilmember Scully introduced Potential Amendment #1 to reduce the General Appropriations by eliminating the 10k expense for the Greater Seattle Partners investment contribution. This was proposed by Mayor Hall. Councilmember McGlashan agrees now it is too focused on Seattle rather than on the tri-county region. We don’t have space for really large companies like Microsoft or Amazon, however we could certainly find space if it were brought to us. He supports the amendment until we know more about their focus. Councilmember Chang feels we don’t know what this group will do once it is up and running beyond developing its own organization. Councilmember Roberts states that the Sound Cities Organization wants an advisory committee made up of cities like Shoreline to provide input. He prefers waiting until we get a better sense of how the organization will proceed, rather than leaving now and changing our minds later. 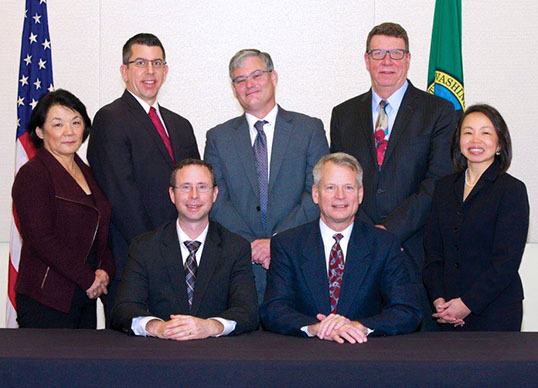 The Mayor stated he sat on the board of the two predecessor organizations and after five years of seeing no benefit to Shoreline, he stepped down from the board. The Mayor said we talk about these small amounts of taxpayer money spent for these various member organizations. Some are more useful than others. He finds this one duplicative. Roberts says if the City keeps paying, Staff will continue to work to see what they are all about. City Manager Terry agrees if it were removed from the budget, they would not consider it a priority. Mayor says staff and council would always be open to discussing it. Chang prefers to be in favor of until usefulness is determined. Councilmember Roberts moved to add frontage improvements to the northside of NE 200th across from Aldercrest School. It is being remodeled and will have some frontage improvements but not full sidewalks. We need to add it in as an unfunded project to the TIP and CIP so the staff can look for Safe Schools grants. Scully is not supporting. The Sidewalks Priority list has already been made and this didn’t make the list. It should be included in a future sidewalk review using the priority list. Chang asked how Safe Routes to Schools. (SRS) fits in with the Sidewalk Prioritization Program. Tricia Juhnke, City Engineer, says SRS is reviewed every two years. The Sidewalk Prioritization program is a separate review so even if this sidewalk doesn’t rank high enough for city funding, it will still be reviewed for SRS. With or without the amendment, these reviews will proceed. City can apply for SRS whether or not it’s in the TIP but it’s nice to have. The TIP will be updated in the spring. Roberts withdrew the motion for further discussion next spring. Roberts moves to amend the budget to increase general fund appropriations to add 51K to the public arts fund for installation of the public art project. Councilmembers Scully and Salomon spoke in favor of the amendment. Chang requested clarification that the 1% arts fund is depleted and this transfer from the general fund will allow the City to move forward with this project and still support the public arts coordinator position through the next Biennium. They are planning to do an evaluation to identify a sustainable funding source for public arts fund. Chang supports this amendment to honor the work of all the people who volunteered and spent their time developing it. Chang also commented she favors the idea of the physical art along Aurora. City Manager Terry stated the current art plan does not include the funding for multiple pieces of sculpture along Aurora but this could be part of phasing in when a new source of sustainable funding is identified. McGlashan commented on the Artwalk in Colorado Springs - this an excellent idea although not something we can fund. He requested confirmation that the amount is 51k in lieu of 50k (correct), that this is one-time funding (correct) and is adequate (correct). He supports finding a more sustainable source of funding. Mayor Hall wants to know how to engage the philanthropic and benefactor communities in the city of Shoreline. He has been at the Aquarium as well as other institutions in Seattle and sees benefactors who live in Shoreline. He would like to find a way to encourage the benefactors who live in Shoreline to provide some of these gifts to Shoreline as well as Seattle.